I’m having technical issues. Creativity issues. Inspiration issues. I wanted to do a pictorial. It’s not something I do, or rather, have ever done. I always enjoy pictures in other blogs, they seem to add a taste of reality to the people I like reading about. 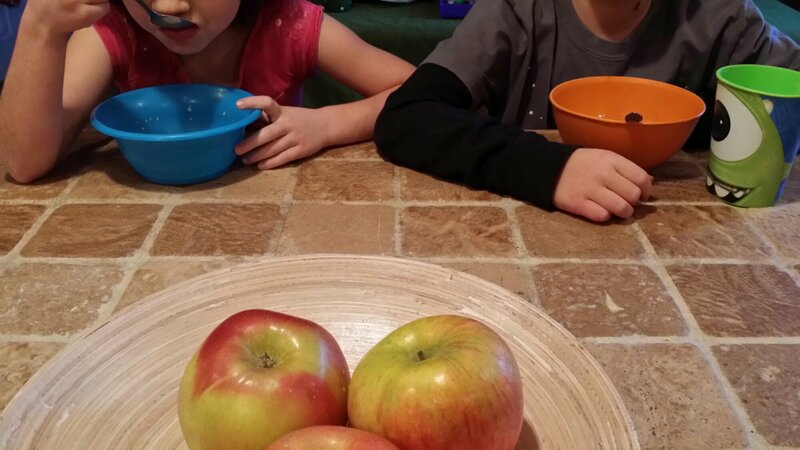 Without boring you with the details, please enjoy this one single picture of my two youngest eating breakfast before school on Friday. Special Man commented on my “good eye” with this picture. Taking pictures is something I’d like to explore more in the next year. I’ve been contemplating my New Year’s Resolution list, which I’ve come to look forward to more and more in the past five years or so. It’s exhilarating to think about the potential for change and the possibility of new and good things to come. Someone recently suggested I try twelve goals for the upcoming year, and that sounds like an awful lot but I’m a little bit giddy about trying it. Yesterday I had a big cookie swap party planned, and it was a huge success. Mostly, I count it as a success because I managed to give my kids something they really wanted to do: a big gathering with friends and family. And also, because my head didn’t explode from the stress. I had planned the most casual, low-stress (I thought) thing that I could think of that was festive and would accommodate both a large number of people, and a wide age-range. I’m disappointed that none of my siblings could be there, but there were cousins and grandparents and friends everywhere. The stress came from this cookie making. I had scoured Pinterest (yes, I do love Pinterest) for an easy, yet impressive holiday cookie recipe. I found something called Oreo Cookie Truffle Balls. Perfect, I thought. Different but simple. They turned out to be different, yes, but they were anything but simple. Halfway through the first batch, I knew I needed a Plan B. Enter Special Man Friend, stage right. SMF rescued me with gluten-free peanut butter cookies, and he didn’t even blink an eye over it. He got the ingredients from the store, he let the kids help roll them out, he did it all. Then he braved the local dollar store with me, on a Saturday no less, ten days before Christmas, so that I could pick up coloring books and crayons for the cousins to have during the party. He wasn’t phased. Or rather, he may have been phased, but he didn’t let it stop him from doing what needed to be done. And he didn’t take it out on me. I found myself expecting an explosion or a meltdown from him, and I think that was simply a residual situational expectation leftover from my childhood and my marriage. I really wanted to tell SMF that we should just forget the coloring books. That we should just go home. That the traffic was too bad. All of this, in an effort to avoid the explosion or meltdown that I thought was just under the surface. Of course, he’s a different man than either my father was, or my ex-husband is. And he hasn’t ever given me cause to expect those negative reactions. It’s fascinating to me, the patterns that we train ourselves to recognize and feel and react to. Tags: children, Family, Love, Polyamory, Relationships | Permalink.